Charming 2BR ~ 1 Door 2 Shore*Large Ocean Front Deck+ Pvt Patio *Great Dec rate! Best Seats on the Beach @ ~One Door to the Shore~ Text for special rate last minute rates. OCEAN VIEW Charming Beach House. 2 Bedroom, 2 Story Detached Home. First house in from the boardwalk with over 400sq ft of private Ocean Front Decking. Sit Down Views of Sand Surf & Spectacular Sunsets. Fall asleep & wake to the sound of the surf. Sleeps, 5-6, Master Bedroom upstairs has Queen bed and French Doors that open onto a spacious sun patio. Patio is very private & protected with peak ocean view. It is lovely to sit out there for morning coffee, private afternoon sunbathing and evenings with the relaxing sounds of the surf. Downstairs bedroom has full + twin bed. The kitchen is Fully outfitted, including the essential coffee maker & blender. Ocean view cooking outside with BBQ on the front deck as well as ocean view from kitchen & dining table inside. There is new tile flooring throughout. Bathroom has romantic Claw Tub for a relaxing evening soak + a separate stall shower. 1 car attached garage fits most cars & SUVs. Brand new kitchen, windows and flooring throughout. Easy stroll along the boardwalk to best Mission Beach restaurants and favorite outdoor coffee/breakfast place. 3/4 mile north of Belmont Amusement park, 3 miles from Sea World. 5 miles to Down town and airport. Great biking paths around the Bay and Ocean. Also located opposite the Catamaran Hotel on the bay side of Mission beach which offers all kinds of water sport rentals and the most fabulous beach side Sunday Brunch. This is a great location for a beach vacation! We love this relaxing view and we love being this close to the beach. It is a very nice, quiet coutyard, primarily owner occupied, This house maximizes outdoor space to really enjoy the pleasures of being seaside, with the comfort of home. Elevated deck offers unobstructed sit down views of sand surf and spectacular sunsets! It is a great location for a family Beach Vacation. Dreamy claw bathtub plus a separate stall shower. First house in from the boardwalk, facing the courtyard. 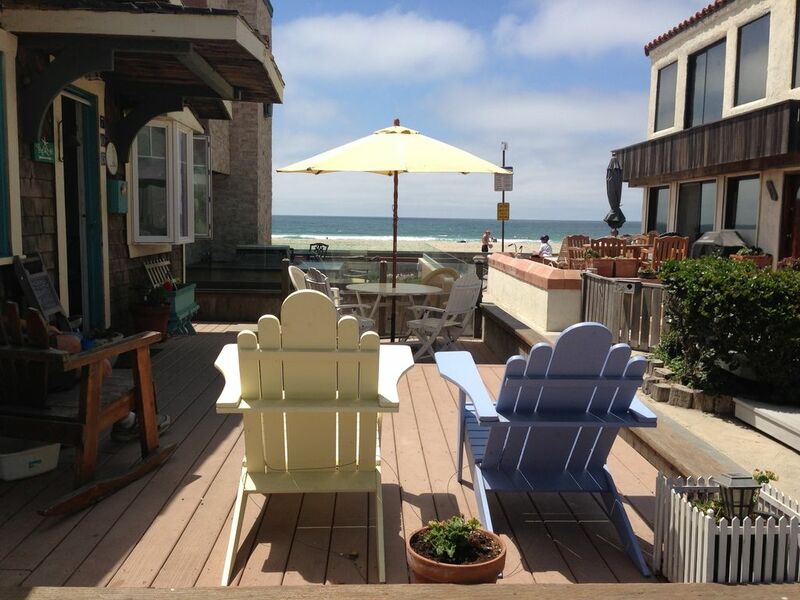 Sit down Views of Sand, Surf & Spectacular Ocean Sunsets! Great Surf spot right out front. Ocean view dining, inside or out! Large tiled patio with peak ocean view. Small Bar height table, love seat glider and lounge chair. Location was the key! Walking distance to places to eat and stores. Cute cottage by the ocean. Cindy was very accommodating and is a very responsive host! If you are looking for a place to stay in Mission Beach just steps from the Ocean, this is the place for you and your family. We loved our stay at the beach! It was the perfect location with many great places to eat within walking distance. House was perfect size for our family of 5. Couldn’t have asked for a better stay! Charming beach house just steps away from Mission Beach. The kitchen has all the basic essentials, and we used it daily to minimize our time in restaurants. How we, there are plenty of restaurant choices with walking distance. Parking is a big challenge in San Diego (we are from Wisconsin and not really used to this! ), so having an attached garage here was great. We used the grill out on the deck twice, and went out to watch the sunset on the beach every night. Cindy was a great hostess, responding to our questions quickly. I would highly recommend this property! We had a great time. The cottage was in a great location and Cindy was great! The house has a lot of character & is very cozy. Stocked with ample supplies for cooking. The bed upstairs is very comfortable and it was relaxing listening to the waves. Great view from the front deck & easy walking to excellent restaurants, bars & coffee. I felt very safe walking around even later in the evening. The garage was convenient to have but it is small, anything larger than a compact car would need to leave the door open. Cindy was very responsive & gave us recommendations of places to eat. We will definitely be back when the weather is warmer!